Complications may occur after tooth extraction procedure. Some complications after tooth extraction are common and some are not that common. Extraction is painless removal of tooth or tooth roots with minimum trauma to the surrounding tissues so that the extraction socket wound heals uneventfully without any post-operative complications. Tooth extraction complication symptoms are prolonged pain; swelling, bleeding, bruising, limited mouth opening and many others. Various Tooth extraction complications are discussed in detail in this article. It is the most common complication which occurs after the tooth extraction procedure. After the tooth removal, there is bound to be some kind of discomfort and pain. The pain and soreness may last for few days after tooth extraction. Painkillers are given by the dentist to control the pain. Pain meds such as Ibuprofen, Tylenol, Paracetamol, Solpadeine or Nurofen Plus can be used to control the pain. The painkillers which are prescribed by the dentist are dependent on the medical history of the patient and the effortlessness with which the tooth was extracted. Swelling is other common complication after tooth extraction. Swelling after tooth extraction procedure is a normal body reaction and is indicator of normal progress of healing of tooth extraction socket. If swelling persists beyond 1week, then the patient needs to visit the dentist. After extensive surgical interference, simple inflammatory edema appears in adjacent tissues in most of the cases. This is unavoidable and is generally commensurate with the degree of surgical trauma. Swelling usually occurs after the tooth removal. The swelling can be there for as long as few weeks. The swelling can be treated by using an ice-pack or by pressing a bag of frozen peas against the cheek near the tooth which is removed. This will help to lessen the swelling. Alcohol, hot foods and drinks and work out immediately after the tooth extraction can aggravate the swelling. Warm saline rinses and hot moist compresses 1-2 days after tooth extraction will further help in reducing the swelling. Bleeding is other common tooth extraction complication. Slight oozing of blood may occur for up to 24 hours after the tooth extraction. It is considered as normal. If the bleeding is continuing after tooth extraction, then the patient can put a piece of gauze pad on the bleeding socket area with equal pressure without irritating the socket. Biting on tea bags may also stop the bleeding. If there is prolonged oozing of blood even after 24 hours or incases of heavy bleeding after 1-2 hours after the tooth extraction, dentist should be consulted. There are some people who are more likely to bruise than others after tooth extraction. These are usually older people, people on aspirin or steroids as they tend to bruise much more easily. Intermittent ice packs should be given for the first 24 hours after the tooth extraction procedure followed with intermittent hot moist packs. It is not a gangrenous process and discoloration is due to bleeding into the tissues. Accumulation of red blood cells and subsequent break down of hemoglobin causes discoloration. The bruising can look quite prominent and might take weeks to disappear in some cases. Many a time’s the chewing muscles and the jaw joints are so sore after the tooth extraction that it becomes really difficult to open the mouth. This can happen for a few days after the extraction. In case the patient gets an infection after the tooth extraction in the tooth socket then he will not be able to open his mouth for a much longer period say as much as a week. Although Pain is the most common tooth extraction complication, trismus can become one of the more chronic and complicated problems to manage. A person might also develop an infection in the socket after the surgical extraction of the tooth. This usually happens about 2 – 4 days afterwards and one knows of it from the deep-seated throbbing pain, the bad breath that the person emits and the perpetual unpleasant taste left behind in the mouth. Dry socket is a painful tooth extraction complication. This kind of an infection is more bound to happen if a person smokes, use Contraceptive Pills or are on drugs such as steroids or if the bone cutting is done during the tooth extraction. Secondary infection that is infection several days after tooth extraction may occur. It mostly occurs after surgical removal of wisdom tooth. The patient will have fever, abnormal swelling, pain or a salty or prolonged bad taste with or without discharge from the surgical site as post tooth extraction complication symptoms in case of secondary infection . To avoid this, patient has to maintain good oral hygiene and should avoid smoking and drinking alcohol. To treat infections, antibiotics are given by the patient. The pain meds and antibiotics which are given after tooth extraction may have side effects. A patient may experience nausea, vomiting, drowsiness from the medicines which are provided. Patient can consult his dentist in such cases and can tell him to change his medicines. Numbness and tingling sensation occurs when the nerve is damaged or is injured during the tooth extraction. Nerves are responsible for sensation in the tongue and lips and may get affected while giving the anesthesia. The nerves may get squashed, bruised or stretched which could result in numbness. This kind of nerve bruising is usually not permanent but in the rarest of rare cases it might be permanent as well. The temporary phase might go on for a long time and may last from several days to several months. No one can actually say how long the nerve will take to get rid of the nerve bruising and come back to its normal mode of functioning. Sometimes, bony flakes also known as sequestra result from the sockets of the extracted teeth and the patient can feel the roughness with the tongue in the socket area. They may cause soreness and will interfere with the healing after tooth extraction. They need to be smoothened by the dentist. At times, the gums heal on their own whereas some times it becomes imperative to smoothen the underlying bone for healing to take place. Bleeding into the cheeks can result in swelling after tooth extraction which may be hard to feel. This could also go on to result in a difficulty in being able to open the mouth and also result in bruising at that particular spot. The swelling, bruising and mouth opening will all get better with time and come back to normal. Periodontal damage may occur after tooth extraction. Periodontal pocket may occur after wisdom tooth extraction if the tooth is deeply impacted and there is no bone between second and third molars. To treat periodontal pocket, scaling and root planning is done. Gum surgery may be required to treat it. Gum tissue may be deteriorated after tooth extraction. It is a rapidly spreading infection of floor of mouth and is life threatening. Fascial spaces are affected in this. Difficulty in breathing, difficulty in mouth opening, swelling and severe pain is Ludwig’s angina complication symptoms. Though it is extremely rare but one still needs to take extreme care if one gets infected by Ludwig’s angina. It is a rare dental condition which may occur after tooth extraction or other invasive procedure. 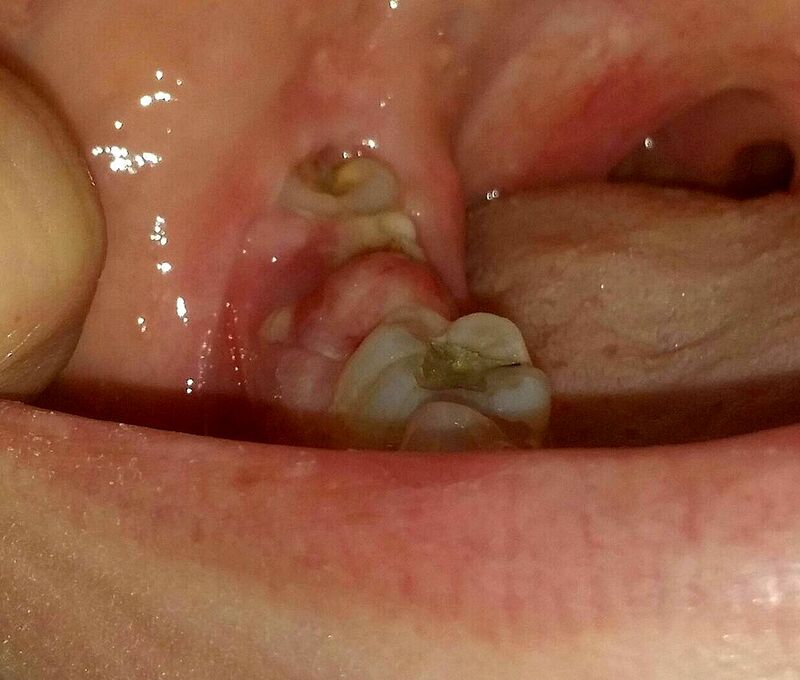 In this condition, there is no sign of healing even after 8weeks of dental extraction. The gums are worn away in this condition and underlying bone is visible. This condition is mostly seen in cancer patients. It is a rare Tooth extraction complication. Osteomyelitis may occur after tooth extraction. There is inflammation of bone and bone marrow in this condition. In case of acute osteomyelitis, there is severe throbbing deep seated pain present along with swelling. The teeth may be loose and pus may extrude from the socket. Fever and enlargement of lymph nodes may be present. In case of chronic osteomyelitis, there may be fistula and sinus tract formation on skin and mucosa. This complication happens four to five days after tooth extraction. The main reason for it to occur is a foreign body in the tooth socket that starts the infection and allows it to set in. This could be the result of e.g. amalgam remnants which is from the tooth filling, bone chips, small tooth pieces, calculus etc. The way this works is that the foreign bodies aggravate the area and this goes on to stop the post-extraction healing and suppuration of the wound happens. It is treated with debridement of the socket and removal of any and every causative agent of the infection. This is the best and only way to go about it. It may occur after wisdom tooth extraction. This tooth extraction complication is unusual and is temporary. To treat this condition, anti-inflammatory medicaments, heat therapy, rest and in some cases bite splint therapy is given.